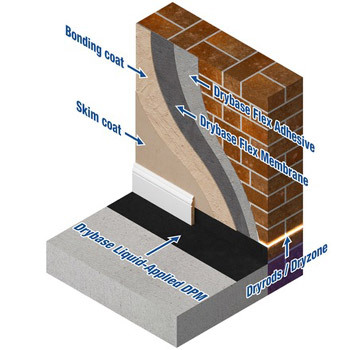 Drybase Flex Membrane is a relatively new addition to our damp proofing arsenal and is ideal for masonry walls and for damp proofing to concrete slabs as a DPM (damp proof membrane). Once laid on concrete floor it can be tiled, carpeted, boarded, laminated or otherwise covered with practically any floor finish. 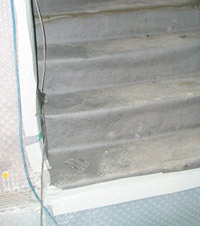 However, if carpet is to be used we always insist on the grippers being glued down and not nailed through the membrane! Drybase Flex Membrane is a highly durable and flexible damp proofing membrane for direct application to walls that have been affected by dampness and salt contamination. The flexible nature of the membrane can also make it the ideal choice for walls where retaining some of the 'roll and shape' in the wall is desirable due to the character and age of the building. The fleece lined membrane can be applied to walls using the specially formulated Drybase Flex Adhesive. The great advantage with this type of membrane damp proofing system is that it can be plastered onto directly creating a versatile solution to the problem of damp walls, when it is not possible to stop the damp at its source. This is especially useful where a cavity drain membrane such as Oldroyd Xp Plaster Membrane is not practical due to drainage or substrate issues. Drybase Flex Membrane is a watertight low-profile sheet membrane offering ideal protection against dampness in walls without the need to drill and install plugs. The membrane is a 1.5mm thick flexible polypropylene sheet with a fleeced surface on both sides. The two fleeces ensure good adhesion both to the wall by means of Drybase Flex Adhesive, and for the direct application of plaster to the face. This membrane can be useful in all sorts of places, for instance where the substrate is too weak for the plugs required by a cavity drain membrane. The picture above even shows it used above-head to a weak arch where the Oldroyd Xp Membrane couldn't go! The picture left shows a new concrete set of steps down to an old basement. A new timber staircase was constructed on top of the system, completely protected by the Drybase Flex Membrane. Drybase Flex Adhesive is a polymer modified cement-based product used to fix Drybase Flex Membrane to walls. It is mixed with water, and applied by trowel. We have found that the adhesive is an excellent waterproofer in its own right and when the completely impervious membrane is added to the system it gives a protective barrier you can have confidence in. Here's a bit more information at our Drybase Flex Membrane Blog.